Cells are great recyclers. They need to be, otherwise we would be faced with an insurmountable need for new molecular building blocks and enough energy to manage them. For instance, new messenger RNA chains are made constantly, transmitting information from the nucleus to build new proteins. Afterwards, these chains are broken down and the components are recycled. A complex set of salvage machinery is used to recycle these components. The enzyme hypoxanthine-guanine phosphoribosyltransferase (HGPRT) is one of the central enzymes that recycle the building blocks of RNA and DNA. It attaches a purine base (either guanine or hypoxanthine, a modified form of adenine) to a sugar, creating a nucleotide. 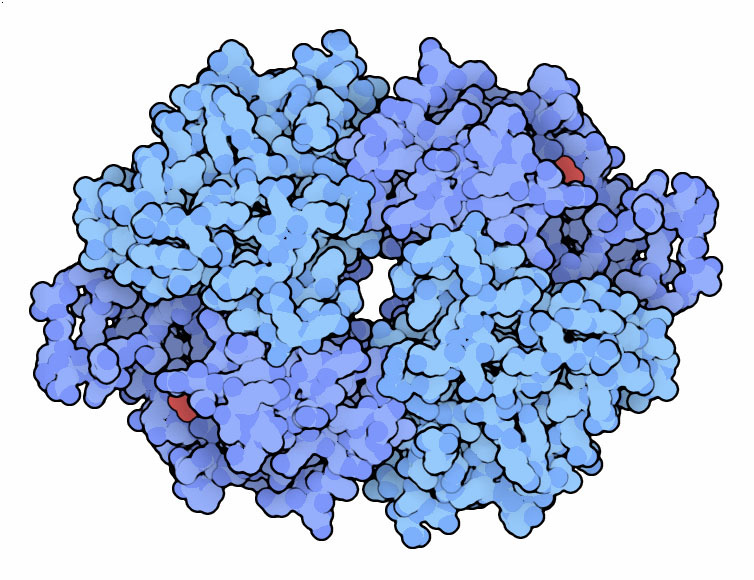 The structure shown here (PDB entry 1hmp ) is the human enzyme, which is composed of four identical subunits, each with its own active site. This structure includes the nucleotide product, guanine monophosphate, just before it is ready to be released for use by the cell. As with all metabolic pathways, serious problems occur if steps in the pathway are blocked. Some people inherit a rare defective version of HGPRT, which leads to a serious illness termed Lesch-Nyhan syndrome. Since the enzyme is not active, purine bases build up causing severe neurological problems, including a dangerous compulsion for self-injury. In other cases, people with partially active HGPRT have problems with gout, as the pathways for discarding excess purines are overloaded and the waste products build up in the joints. HGPRT is particularly important to the parasites that cause malaria and similar parasitic diseases. Since they live inside cells, they have lost the ability to make purine bases on their own--they just get them from the infected cell. This makes them particularly susceptible to drugs that attack HGPRT. 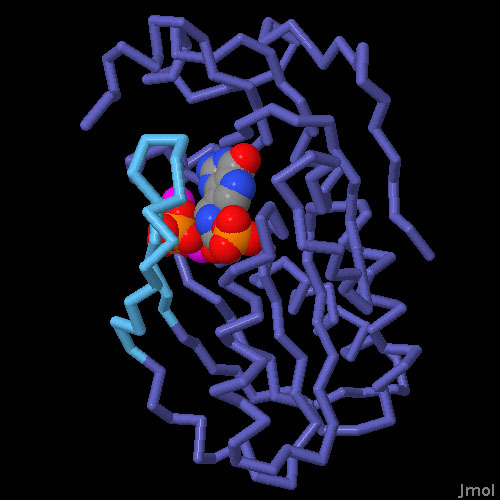 Researchers are currently using the structures of HGPRT, such as the one shown here from PDB entry 1cjb , to discover new drugs to fight malaria, by taking advantage of differences between the human and malarial forms the enzyme. HGPRT performs its reaction in several steps. First, an activated form of the sugar binds, followed by the purine base. The enzyme then connects the two, releasing a pyrophosphate molecule. Finally, the nucleotide is released in the slowest step of the whole process. Researchers have captured the enzyme performing several of these steps, including the empty enzyme (PDB entry 1z7g ), the enzyme with the sugar and base in the active site (PDB entry 1d6n ), a complex with an analog of the transition state (shown here from PDB entry 1bzy ), and a form with the final product in the active site before release (PDB entry 1hmp ). 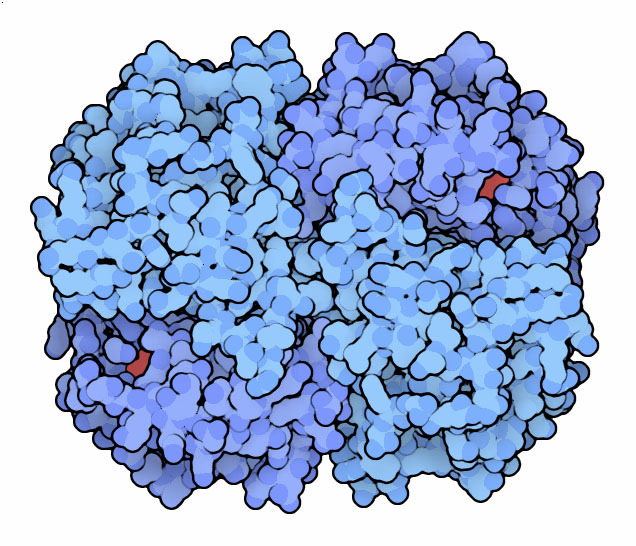 A large loop (shown here in turquoise) opens and closes around the active site during the reaction. To explore these structures, click on the image for an interactive Jmol. You can use the Compare Structures feature at the RCSB PDB to overlap and compare the structures of HGPRT from human cells and from malaria. The structures in the Jmol were also overlapped with this feature to show the motion of the loop. Complexes of HGPRT with several potential anti-malarial drugs are included in the PDB. You can compare these with the structures of the substrates and products of the enzyme. R. J. Torres & J. G. Puig (2007) Hypoxanthine-guanine phosphoribosyltransferase (HPRT) deficiency: Lesch-Nyhan syndrome. Orphanet Journal of Rare Diseases 2:48. D. Voet & J. G. Voet (2011) Biochemistry, 4th Edition. J. Wiley & Sons, Hoboken, NJ.